Spring is just around the corner and that means some of us may be planning road trips with our dogs. Part of that planning should include how to travel safely with pets. A survey by the American Automobile Association showed that over 80% of dog owners drive with their dog in the car but only 16% of drivers traveling with their pets restrained their pets in their vehicle. The remaining 84% did not restrain their dogs! An unrestrained dog can be distracting to the driver and increasing the risk of a crash. The Triple AAA Foundation for Safety found that a driver looking away from the road for even one second doubles the risk of a crash. Inside a moving vehicle, unrestrained dogs are a hazard to themselves and to others. 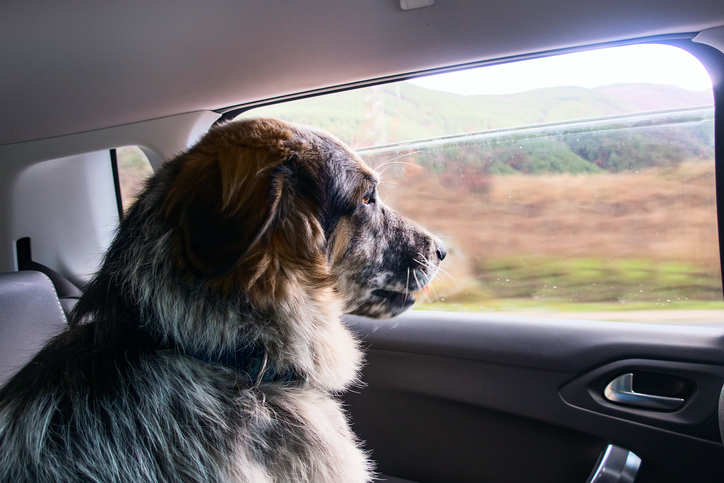 In fact, according to the BCSPCA website, a 50-pound pet, when traveling at speeds of 50 km/h, has the weight of approximately one ton (BCSPCA 2009). Pets and passengers can get hurt or killed when dogs are unrestrained and the vehicle they are riding in slows quickly, swerves or comes to a sudden stop. If the dog is riding in the front seat they can be killed if the airbag is deployed so the back seat is safer for the dog. An unrestrained dog can bolt out of the vehicle when the door is opened and be hit by another vehicle. If the vehicle is involved in a crash, the frightened dog can be in shock and run and hide. In some areas, pets must be restrained while traveling in a vehicle and having an unrestrained dog may invalidate the car insurance but this is not the law everywhere. The good news is that there are many things people can do to be safe when traveling with a dog. A seatbelt harness or a secure crate will restrain the dog when traveling. If there is any chance the dog will chew through a seatbelt, opt for a crate. Buy a crate or seatbelt harness that is the right size and is crash-tested. There are no government safety standards for crates and seatbelt harnesses but an independent volunteer organization called “Center for Pet Safety” has testing and publishes results. Attach an information sheet about your pet (address, vet information, vaccination, medical and food information, the name of a friend or commercial care place that can look after him if you can’t) to the crate. Make sure your dog has identification. Microchips work well as they can’t come loose and many impounds and shelters and veterinary offices will search for a microchip when a dog is found. Make sure the information about the company is up to date. Collar tags make it easy for someone to reach the owner if the information is current and visible. In many places, dogs are tattooed inside their ears when altered and the tattoo is linked to the veterinary hospital who have the owner information. Have up to date photos taken from different angles so your pet can be identified if he or she goes missing. Dogs should never be transported in the bed of a truck without using a secured crash-tested crate. Dogs are at risk of getting debris into their eyes, bolting from the bed and hanging themselves on a leash or getting hit in traffic, and being exposed to the elements if transported in this way. In many places, it is also against the law. In BC, Canada, Section 72 of the Motor Vehicle Act prohibits the transport of an unsecured pet in the back of a pick-up truck (www.bclaws.ca n.d.). Have happy and safe travels with your pet!